"... I am greatly concerned that OSD (Ed note: OSD Office of the Secretary of Defense) processes have often become ad hoc and long established conventional processes are atrophying. Specifically, there are areas that need your attention as the ad hoc processes often do not adequately consider professional military judgment and advice. First, the JROC (Ed note: JROC Joint Requirements Oversight Council) process has largely supplanted the traditional role of the Tank and members of the JCS (Ed note: JCS Joint Chiefs of Staff) are not given the opportunity to express their best military judgment as often as they should. A failure to do so does not serve the President or the Nation very well. Second, there is a lack of strategic review to inform our day-to-day issues. A comprehensive, strategic framework is required to provide consistency and long-term perspective. Otherwise, decisions tend to be made piecemeal and are often internally inconsistent. Third, there has been a lack of explicit discussion on risk in most decisions. Without this explicit discussion, there is opportunity to miscalculate with unacceptable consequences. For those of us who consider risk assessment to be part of our core responsibilities, it is much easier to execute decisions aggressively once risk has been quantified. Fourth, I have seen a tendency to compartmentalize analysis, both within OSD and then between OSD and the Services. All would be better served through a process where data and analysis is more easily shared so that decisions can be reached in a more transparent and cooperative fashion. 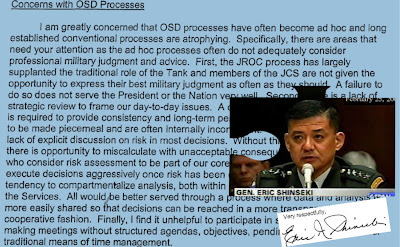 Finally, I find it unhelpful to participate in senior level decision making meetings without structured agendas, objectives, pending decisions, and other traditional means of time management ..."
- General Eric K. Shinseki, 34th Chief of Staff of the United States Army (1999-2003), in his "End of Tour Memorandum" to Secretary of Defense Donald Rumsfeld. General Shinseki was best known for being on the receiving end of SecDef Rumsfeld's wrath by saying (when testifying to the Senate Armed Services Committee and pressed on the number of American troops necessary to stabilize a post-war Iraq) "... I would say that what's been mobilized to this point -- something on the order of several hundred thousand soldiers are probably, you know, a figure that would be required. We're talking about post-hostilities control over a piece of geography that's fairly significant, with the kinds of ethnic tensions that could lead to other problems. And so it takes a significant ground-force presence ..."